We are thrilled to continue the tradition of honoring two amazing women - our Bridgets. Bridget Slotemaker and Bridget Spence touched many and, each in her own way, are an inspiration to all. The Bridget Awards are presented to people and organizations that continue to inspire us with their dedication to the fight against cancer and their continuous support of young women everywhere facing a breast cancer diagnosis. Sara Campbell is the designer, founder, and CEO of Sara Campbell Ltd. She has conceptualized and designed her line of women’s apparel for the last 30+ years. Philanthropy has always been synonymous with the Sara Campbell brand. As Sara likes to say, “We believe in people helping one another, it's that simple.” Sara Campbell LTD embodies the personal grace and spirit of its founder Sara Campbell. In each of the communities where there is a Sara Campbell boutique, there is also a commitment to improving the local community. Sara tirelessly hosts numerous giveback events within her stores that support trusted charitable organizations both local and national. Sara has dedicated her life and business to working for the common good. Sara has always seen her business as a vehicle to help charitable causes, with particular focus on women’s issues. Her longstanding commitment to organizations such as Go Red for the American Heart Association, St. Jude Children’s Research Hospital, Kids Clothes, The Ellie Fund, The Breast Cancer Research Foundation and many others has not only raised money, but also helped engage her employees and customers in these important causes. Sara was among the early supporters of the Young and Strong program at Dana-Farber Cancer Institute through the Evening for Bridget. As a business owner in an industry increasingly manufacturing overseas, Sara supports keeping jobs in the USA and in Massachusetts. A fashion designer, entrepreneurial business owner, wife and mother of two daughters, Sara Campbell has made her customers look good for decades while encouraging us all to do good. Bridget was a vibrant, kind-hearted, and generous 35-year old woman whose love and zest for life was evident in all she did. Her smile was brigh﻿t and contagio﻿us; it lit up every room. She was charismatic, funny and enthusiastic about even the smallest of things. Wherever Bridget went, she made lots of friends. Above all else, Bridget was a devoted and loving wife to her husband Steve, 2 ½ year old daughter Grace, and their soon-to-be second child, due in September of 2008. In May of 2008, when she was 20 weeks pregnant, it was discovered that she had an extremely aggressive form of cancer; it was Stage IV and she was given only months to live. Bridget fought her cancer courageously and because of her strength and determination, she was able to deliver her second baby prematurely, a little girl Chloe Faith, who weighed only 1 lb 2 oz at birth. Like her mother, little Chloe was strong, spirited and fought hard for the life she was given. 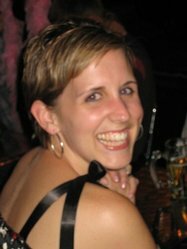 Sadly, on August 12, 2008, Bridget lost her battle with cancer, just three months and 5 days after receiving her diagnosis. Bridget died never knowing the fate of her little baby Chloe. A fate that continues to defy all odds, today, Chloe is a happy and healthy eight year old with absolutely no complications due to her prematurity. Bridget would be so proud of her strong little girl. Carol Chaoui has made it her mission to change the way the world looks at metastatic breast cancer patients. She has gained fame as Wellesley’s Wonder Woman after running the Boston Marathon twice in a costume that embodies her spirit. Carol, a married mother of four, was diagnosed with Stage 3 invasive breast cancer in July 2009 at age 45. She had surgery, chemotherapy and radiation and was on 10-year medication plan to prevent recurrence. On the 5th anniversary of her breast cancer diagnosis, Carol was not able to celebrate. Instead, she was diagnosed with Stage 3 thyroid cancer. Despite her medical challenges, Carol volunteered as a patient advocate and spokesperson for several breast cancer organizations. In 2015, she learned her breast cancer had returned and five months later, doctors delivered more devastating news. Carol’s thyroid cancer had returned and was also considered metastatic. Carol did not spend much time wallowing in her double diagnoses. Instead, she laced up her sneakers and found comfort, courage and purpose in her love of running. Carol ran the Boston Marathon in 2016 and 17, raising more than $200,000 for metastatic breast cancer research at Dana-Farber Cancer Institute. She is the founder of the Wellesley Turkey Trot Foundation, which has raised $225,000 in three years for cancer, medical research and education. She is also the founder of Carol's Corner, a non-profit dedicated to raising awareness and funds for metastatic breast cancer. Bridget Mooney Spence was just 21 years old when a cancer diagnosis interrupted an otherwise perfect life. Newly graduated from Boston University, she learned that she had stage IV metastatic breast cancer, and the focus of her future changed dramatically. Bridget decided however, early in the fight, that cancer would not define her. To know her was to marvel at her ability to put cancer "over there," and to live every day as if the disease were a mere nuisance. Bridget radiated "joie de vivre." She had a career, a husband who was the love of her life, a cadre of girlfriends and a fairy-tale life in Boston. She traveled and partied and enjoyed every minute of that life. To say that Bridget was brave is an understatement. In spite of all the incredible care that she received at Dana-Farber, the trials, the cutting edge medicine and the warmth and love of her caregivers, her options ran out. She faced death stoically, losing her battle on April 4th, 2013. Bridget is terribly missed by all those who knew and loved her.